Where do I use my Farnell voucher code? Add your components to your shopping basket, when ready to checkout click the basket icon at the top right of the screen. On the right under 'Order Total' you can add a voucher code into the box and press 'Apply'. Your order total will be automatically updated with your discount. Checkout securely as normal to complete your order. "Enjoy huge savings in the special offers section." "Sign up for the latest offers and deals." Farnell Element14 is a high-service distributor of technology products, services and solutions for electronic system design, maintenance and repair. They provide fast access to the latest technology, personal service local to you, easy to use online buying tools, delivery information, complete design solutions, engineering expertise and technical support as well as an innovative online engineering community. Farnell Element14 are focused on making it easier to get the products you need when you need them. They have global access with service that's close to home with operations throughout Europe, UK and Belgium. You can find a variety of components at Farnell. You can find passive components such as antennas, capacitors, EMC/RFI suppression, filters, inductors, potentiometers, trimmers and accessories, as well as resistors, rheostats and thermistors. Find components from brands such as Alps, Laird technologies, Nichicon, United Chemi-con and Welwyn. You can search your product by price, availability, manufacturer and relevance so you can be sure to find the exact component you need. Element14 is a brand with access to over 650,000 products and free handling and next working day delivery on orders over £20. 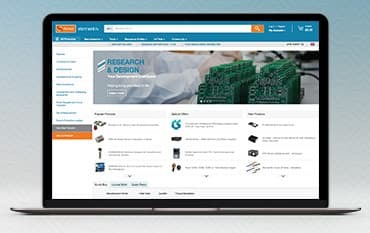 With Element14 at Farnell, there’s no minimum order, free technical support, the latest and newest products added daily, quick buy tools, hassle-free returns and also an online engineering community. You’ll find Element14 products in developments boards and evaluation kits, office, computer and networking products as well as semiconductors-modules. Element14 is an official licensed manufacturer and distributor of Raspberry Pi products. Explore the complete range of Element14 Raspberry Pi boards at Farnell including Raspberry Pi 3. Built on the latest Broadcom 2837 ARMv8 64 bit processor. The new generation Raspberry Pi 3 Model B is faster and more powerful than its predecessors, with built-in wireless and Bluetooth connectivity, it becomes the ideal IoT ready solution. Order Raspberry Pi products now for unbeatable prices, with some even available for same day shipping. Farnell allow you 21 days to return your order to them. It may not be possible for Farnell to cancel your order once you've placed it, however to double check contact the customer service team for further details. How can I contact Farnell? Part of the globe-spanning Premier Farnell family, Farnell UK pride themselves on their reputation as leading providers of electronic, electrical and industrial products for business and home use, with almost half a million items stocked for order through multiple channels, as well as a wide selection of maintenance, repair & operations (MRO) products to keep your systems and devices functioning in tip-top condition. Grab a Farnell voucher code and save on your electronics components. If you’re ordering the type of critical products and components, Farnell offers you likely need them fast, and that’s why Farnell are happy to offer free next day delivery as standard, with additional options for same-day delivery.